Having something that is certain is better than taking a risk for more, or for something better because if you take a chance you might lose everything. I don’t like my job. There is another area of work that interests me, but I would need to quit my job, take a 3-month course, and then apply for a new job when I finished the course. I decided to stay at my current job. 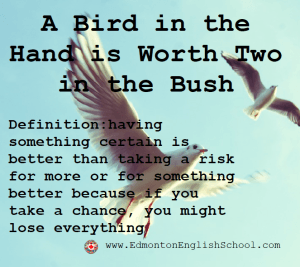 I figure a bird in the hand is worth two in the bush.